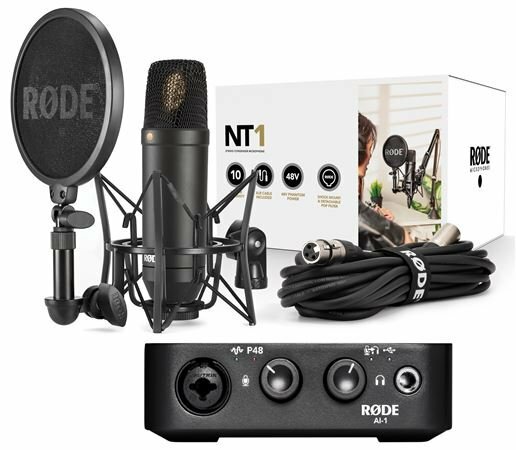 Order your Rode NT1 Condenser Microphone And One-Channel USB Audio Interface Pack from AMS and enjoy 0% Interest Payment Plans, Free Shipping, Free Extended Warranty & 45 Day Money Back Guarantee. 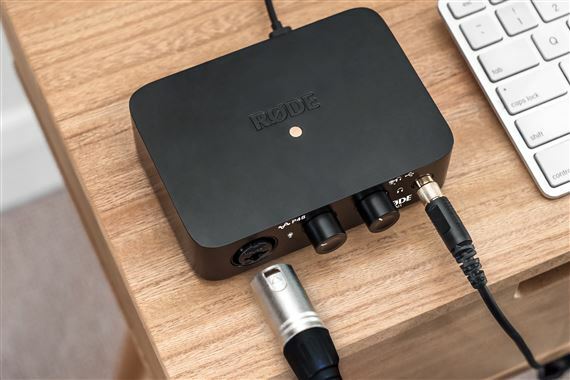 Packed with premium tchnology, Rode's AI-1 single channel audio interface offers studio quality at an accessible price. When paired with the NT1, the quietest large diaphragm condenser microphone in the world, complete creativity is simply a click away. 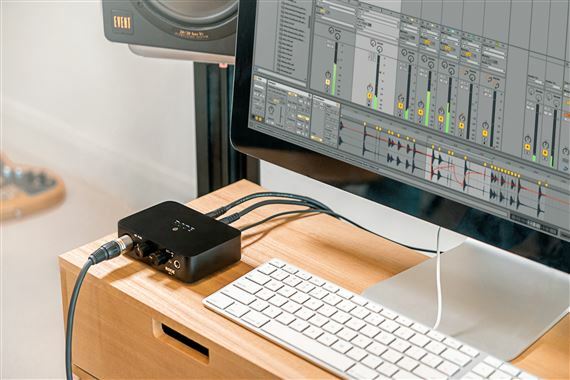 Studio quality and incredibly easy to use, the single channel AI-1 USB interface features a well laid out design. 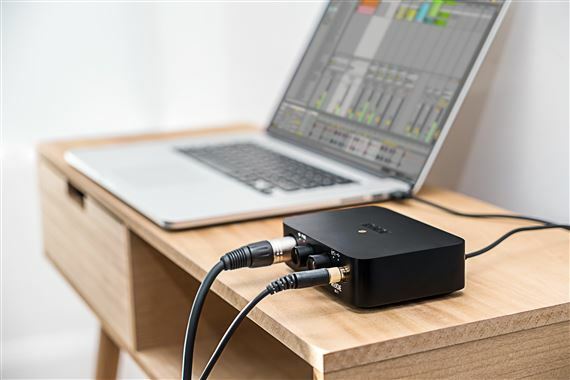 The AI-1 USB Audio Interface adds high fidelity input and output capabilities to your computer, making home recording easier than it's ever been. 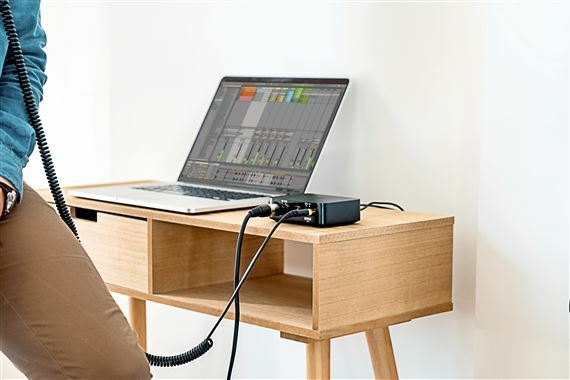 With its high quality Neutrik TM combo jack input and discrete Class-A preamp, you’ll be able to connect either a microphone, guitar or a line level instrument, such as a synthesizer. Since it is Australian Made quality – it is the perfect companion to any of RØDE Microphones. 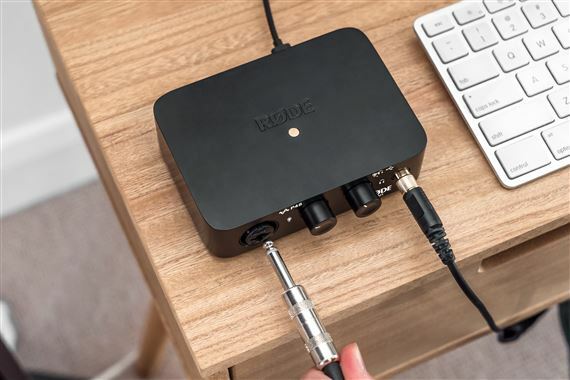 The AI-1 allows zero-latency playback by enabling the direct monitoring feature and playback via headphones/speakers with the high quality discrete headphone amplifier. To ensure the AI-1 is truly versatile it features 48V Phantom Power and is class compliant – so no need to install any drivers. XLR-1/4” Combo Input: Balanced input via 3-pin XLR- 1/4” Neutrik combo socket. Microphones, instruments (guitars) and line level instruments (synthesizers) can be connected via this input. Signal LED: Indicates signal input level. No LED indicates below -60dB. Green LED indicates an input level of at least -40dB, Yellow indicates an input level above -12dB and Red indicates an input level of above -3dB. Phantom Power LED: Indicates when phantom power 48V is applied to XLR-1/4” Combo Jack input. Gain level knob must be pushed to turn on/off. Gain Level Knob: Gain knob for adjusting input gain. Press knob to turn on/off phantom power. Playback/Monitor Level Knob: Gain knob for adjusting headphone / speaker volume. Press knob to turn Direct Monitoring on/off. Direct Monitor LED: Indicates when Direct Monitoring is on/off. When Direct Monitoring is ON, audio from the microphone will be routed directly to the headphones. When Direct Monitoring is OFF, you will hear only audio from the computer. USB LED: Indicates when the AI-1 is connected via the USB cable. USB-C Port: USB-C type connector. Connect to your laptop or computer with the USB cable supplied. Speaker outputs: 2 x 1/4” impedance balanced outputs. The Rode NT1 Cardioid Condenser Microphone was designed to compete with other high quality condenser mics that cost many times more! 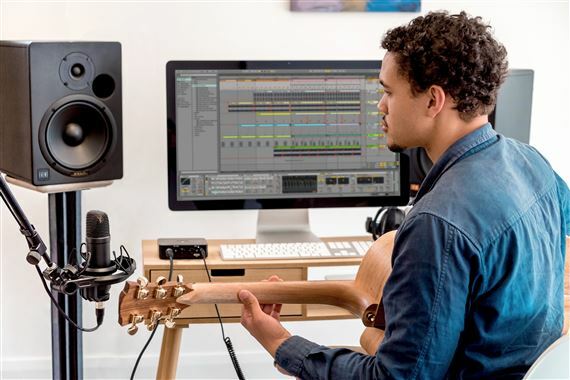 This 1-inch diaphragm condenser mic has been completely redesigned by Rode as a marriage of innovation and tradition, starting with the capsule which is a completely new design. The HF6 capsule on the NT1 vocal mic features a sound signature reminiscent of the famous microphones of old while at the same time exhibiting extremely low noise. 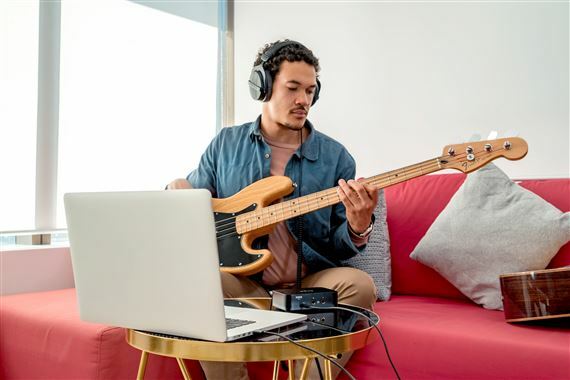 It has been developed by Rode with a focus on detailed midrange response, coupled with silky smooth high frequencies, and warm, round, bass reproduction to make the NT1 an absolute standout in its class. In another world-first for Rode, the transducer of the NT1 is suspended inside the mic using Rycote’s industry-leading Lyre system, minimizing external vibrations at the capsule level. The capsule is then married to high-grade electronics that have been designed to provide the lowest noise level of any studio microphone available. The NT1studio mic is incredibly quiet, measuring only 4.5dBA of self-noise. The NT1’s body is machined from 6061 aluminum and then nickel plated for resistance against corrosion. Finally it is coated in a durable, military-grade ceramic layer, using advanced electrostatic application techniques developed by Rode to ensure an extremely hard wearing finish that is resistant to scratches or marks. Select the NT1-Kit and you'll also receive the Rode SMR shock mount with pop filter! Featuring a unique double-Lyre suspension system, the SMR enhances the existing superior vibration cancellation of Rycote’s Lyre system by using a smaller inner Lyre to act as a tensioning element. This maintains each Lyre in the neutral position where it is most efficient at cancelling vibration. The SMR’s removable all-metal pop filter is as effective as it is visually striking, providing an integrated solution for plosive protection that is easily washable. I like this mic compared to others because everything you need comes with it ready to record. It also looks cool with a built in pop filter. I've worked with different interfaces and mics. For the price this is one of if not the best bang for the buck. Very warm sound, nose levels are low, picks up vocals very very very clear. This is now my go to microphone, it shipped fast and customer service was amazing. Sound and build quality is amazing. I can’t begin to say how many mics I’ve gone through before finally landing upon these. The added bonus was the interface, it allowed me to get rid of my mixers which helped me simplifly my setup. Well worth every penny! I recently switched from the Audio Technica ATR2100 to this microphone and I am very happy with the vocal reproduction of this microphone. It has a flat profile that doesn’t try and boost certain frequency ranges as some of the cheaper microphones do. The Ai-1 audio interface that this kit comes with is also very good. It has a very low noise floor. I am very happy with each component of this kit and with the kit as a whole. I highly recommend.